Within moments of turning this Portable Evaporative Cooler by Hessaire on at your next campsite, cook out, or tailgating party, you'll notice a drop in how hot it feels. A perfect option for on-the-go, outdoor fun, or for cooling down your workshop. The two-sided rigid media, intuitive control panel, oscillating fans and multiple cooling and fan speeds make it the ideal cooling solution for any room or area in your house up to 400 sq. ft.
Take it with you, no matter where you're going. 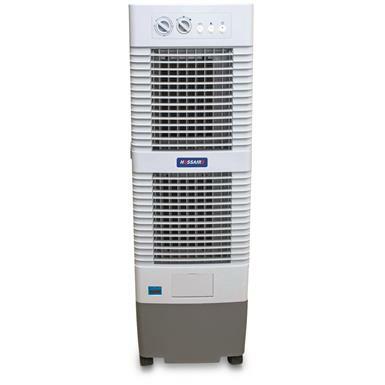 At a mere 34 lbs., this Evaporative Cooler is durable and constructed with heavy-duty wheels for rolling in all types of environments. Parking lots, campsites or even in your home office or garage, take this Cooler with you anywhere. The two-sided, rigid media disperses more cool air through your space, as compared to your standard cooler. To provide cool air to your space, the unit's fan pulls air through the cooling pads where the evaporation cools the temperature of the air. 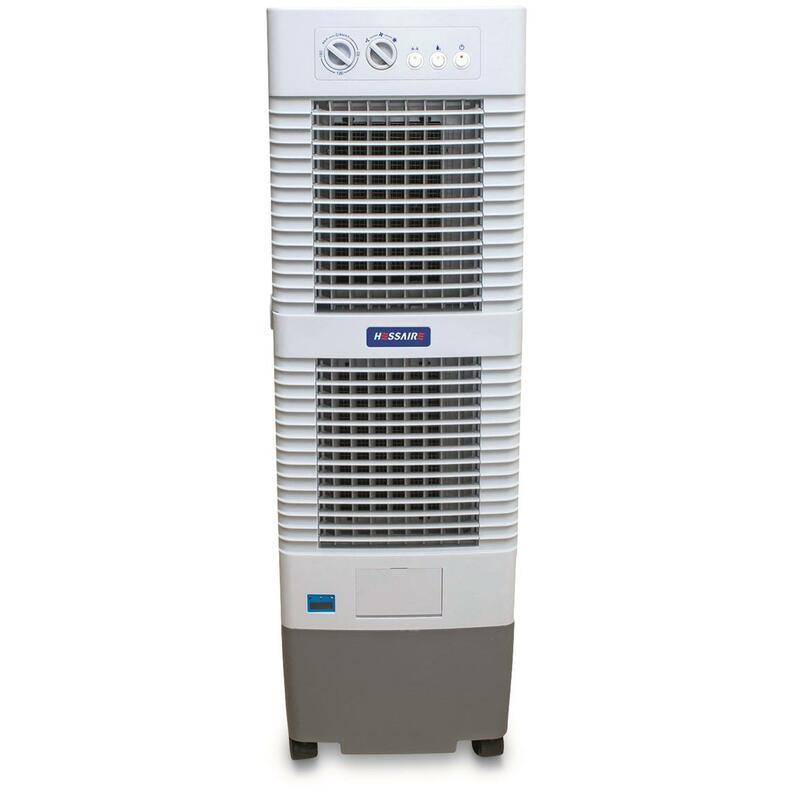 The cool air then exits the unit and provides you relief from dry, hot air. You deserve comfort, let Hessaire help you with that. There is more to this Evaporative Cooler than meets the eye. Not only does it cool the air, but it also propels the chilled air into your space, giving you the ultimate in heat relief. Hessaire's specially engineered features allow this Portable Cooler to provide airflow of 1,100 CFM. The axial prop fan allows it to provide strong airflow, while still being incredibly efficient and quiet. The oscillating fan can be set for left-to-right movement or it can be turned off for a greater fan focus. Also, the fan can be adjusted between 3 speed settings and two cooling levels. These options give you the ability to tailor this Cooler for you personal needs. Simple upkeep and easy operation controls make this Cooler a snap. With the mechanical control panel located on the front of the unit, you have everything you need to control power, fan speeds, cooling levels, and oscillation in one convenient place. Manually fill the unit by opening the water-fill door on the front and just pour the water in. Connecting the cooler to a standard garden hose will allow for a continuous fill of the 14.6-gallon water tank. A float valve inside the unit prevents it from over filling. A full water tanks provides a runtime of 3-4 hours. Note: This is not an air conditioner. The perfect Cooler for tight spaces. 19"l. x 13.75"w. x 14.8"h.; 15 lbs. Always ready to hit the road. Over engineered for legendary ice retention.